There have been quite a number of articles written on the subject of Americans and Passports, and the last good figure seems to be about 1 in 3 Americans has their passport. Be it because America is so large and diverse, or because we’re insular (something I don’t buy), or because overseas airfares are so brutal, many Americans never find themselves in possession of a passport. 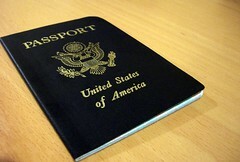 This Saturday is Passport Day, a program through the State Department to get more people to hold passports and explore abroad. The Passport Agency on 19th Street will be having an event for all who might like to get their passport done, and there are a bunch of other locations in DC that will also have photo services on hand to do photos on the spot. You don’t need an appointment, but you will need a birth certificate and a photo ID, and $135 for the passport (payable in two parts, $110 and $25). $30 more also gets you the passport card for ground travel to Mexico and Canada.